This weekend episode of Bigg Boss 11 begins with Salman Khan and Katrina Kaif opening the episode. They are in Salman’s secret chalet. Salman shows the house to Katrina through the glass window. Salman tells her that he can see the contestants from his room, but they cannot. Salman makes a call inside the house and Akash picks up the phone. Salman tells him that he wants to talk to Shilpa. Akash tells everybody that this was the second time Salman wanted to talk to Shilpa. Salman tells Shilpa that he is sending a special guest inside the house and it is her responsibility to take care of the guest and get the male contestants to impress her. Katrina then enters the house; they all go to the garden area and in the first round, boys have to make perfect rotis for Katrina. Katrina disqualifies Akash immediately but praises his rap song. Puneesh makes the perfect roti and he wins this round. Next, Shilpa tells the boys to show off their abs through a belly dance competition, which is won by Priyank and Vikas. For the third round, the boys have to make Katrina’s portrait. Salman joins the contestants through ME TV, which is placed in the garden area. Shilpa asks Salman how will he impress Katrina and he tells her that he has impressed Katrina a lot and doesn’t need to do more. Vikas wins this round. Katrina asks Salman to impress her, and he recites the famous dialogue from Shah Rukh Khan and her film, Jab Tak Hai Jaan. Katrina then takes a leave and exits the house through the confession room. Bandgi Kalra gets eliminated from Bigg Boss 11 house. Salman shows us what happened in the house few hours back. Puneesh was in a conversation with Bandgi, and he told her that no one will be able to control him if she gets evicted this time. Luv overhears their conversation and goes and tells Arshi. Salman announces that Puneesh and Luv will compete in the Sultaani Akhaada. In the first round, they have to convince who out of them deserves to stay in the house. It’s a tie as both of them get the support from four housemates each. In the second round, they have to compete in an Indian wrestling match. Luv wins this round and Sultaani Akhaada too. Salman plays a game with the contestants wherein they have to take one step in the swimming pool every time contestants answer ‘yes’ to a question Salman asks them. Hina is the first one to start. Salman asks Priyank if Hina is insecure about her position in the house, and to Hina’s horror, he says yes. Salman asks Bandgi if it’s true that Hina doesn’t accept her mistake, and she says yes. Puneesh is asked if Hina makes an issue out of small things, and he says yes. Shilpa goes next and Salman asks Hina if Shilpa won’t let go off her hold in the kitchen and she says yes. Priyank is asked if Shilpa is a ‘double dholki’ and he says no. Salman asks Puneesh if Shilpa thinks she is the winner, and Hina interrupts and says that everyone in the house thinks that Shilpa in her head believes that she is the winner. Arshi goes in the pool next and Hina is asked if Arshi gives up in every task, and Hina says yes. Salman asks Puneesh if Arshi will be friends with Shilpa and he says yes. Luv is asked if Arshi will nominate her friends if required, and he agrees. Salman asks Shilpa if it’s true that Arshi is not confident like she was before and Shilpa says yes. Shilpa softly calls Arshi a coward. Salman asks each and every housemate that who will be eliminated out of Luv, Puneesh and Bandgi. Arshi says that Bandgi will go because she has no one apart from Puneesh and that viewers want to see him without her. Salman announces that Luv is safe. He asks Puneesh and Bandgi to go to a secret room so that they could spend some time alone, before one of them gets eliminated. Salman tells the contestants that that it’s up to Puneesh and Bandgi and they have to decide who will leave. They both go to the room and Salman meets them through the TV. Salman asks Puneesh and Bandgi that what’s their decision. Bandgi tells that Puneesh deserves to stay, while Puneesh, who is inconsolable, said either they both will go or he will go. Puneesh asks Salman if he also feels that their romance is for the cameras, and Salman tells him that he feels it’s all real. They are shown a montage of the moments they have spent inside the house together. Meanwhile, there’s a crack in Hina and Priyank’s friendship as the latter called Hina insecure during the task. Soon after, Salman announces that Bandgi got the least number of votes and she has to leave the house. 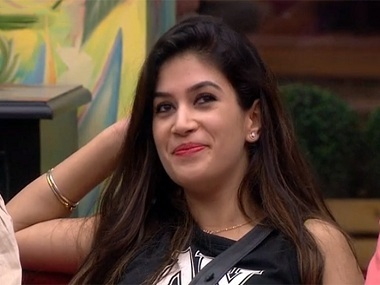 Puneesh leaves her and enters the main house. Everyone hugs him. Akash apologises to Puneesh for all the fights and both decide to give a tough fight to everybody. Arshi tells Akash that now Puneesh will be with him all the time. Akash tells her that he wants to befriend Shilpa again. Both, Akash and Arshi strategise frantically on how they will go about to emerge winner. Akash apologises to Shilpa, but she doesn’t accept. Vikas, Arshi, Luv and Hina are in the bedroom and they think Akash wants to befriend everyone since it’s the day of nominations tomorrow.